Courtesy of my old friend SHUCKS ONE from THE KOOL SKOOL, here's a short but rarely seen interview with ALI SHAHEED MUHAMMED and Q-TIP from A TRIBE CALLED QUEST from 1990. Interviewed by Screaming Rachel (!?) and discussing the Zulu Nation, Jungle Brothers, and the making of the video for "I left my wallet in El Segundo". 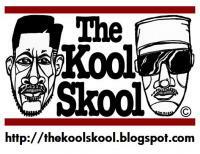 If you haven't been checking THE KOOL SKOOL on the regular then you're missing the scoop hops! SHUCKS ONE is a dude who likes to go all out - he is a graff writer, Zulu Nation member, radio deejay, hip hop activist, youth worker, blogger, and general hip hop connoisseur. I met him around the turn of the millenium whilst deejaying on the now defunct ITCH FM, London's only 100% hip hop radio station. SHUCKS was already preaching the ways of THE KOOL SKOOL back then and has interviewed some hip hop heavyweights over the years. Check out his KOOL SKOOL website using the link above, and also his regular radio shows on SENSEI FM by clicking here.